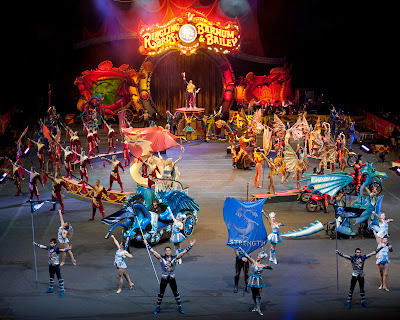 If you have not yet seen the Ringling Bros. and Barnum & Bailey Circus: Dragons, your last chance to catch it is today and tomorrow. My 7 year old son loved the motorcycles in the cages the best. "They went around and around, and then seven more got in and went around! ", he said. The amount of tricks the animals did were fantastic to watch. Animals such as cats, horses, dogs, elephants, tigers and lions were all part of the act. "This circus was the best one I have seen yet," my husband said. "The ringmaster and his assistant were very entertaining, and the stars of the show!" If you have not yet taken the chance to enjoy this year's circus, you can catch it today and tomorrow. Read here for complete details.